Learn how to paint Windsor dining chairs, spindles, newel posts, turned table legs and more without losing your mind or wasting your time. There is an easier way. There are some projects that languish on my to do list for a REALLY long time. 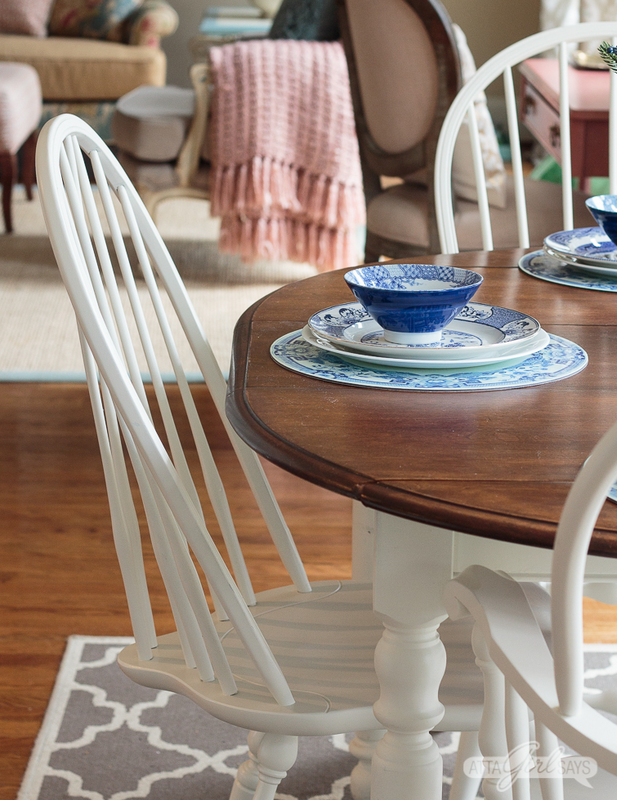 Like painting our kitchen table and Windsor dining chairs. Because I knew it would take FOREVER to paint all those spindles with a brush. 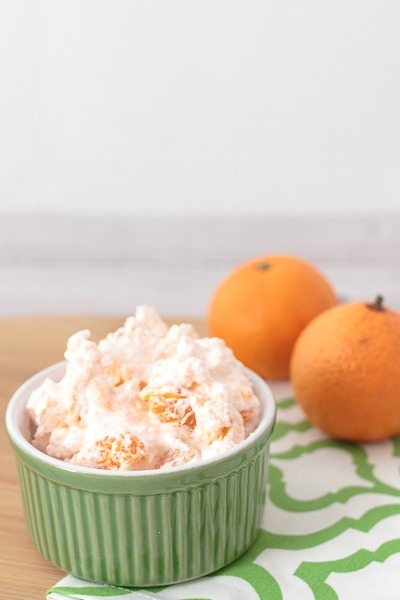 So, I lived with the dated, orange stained finish and scuffed up chairs for way too long and tried to camouflage their flaws with table runners and placemats. 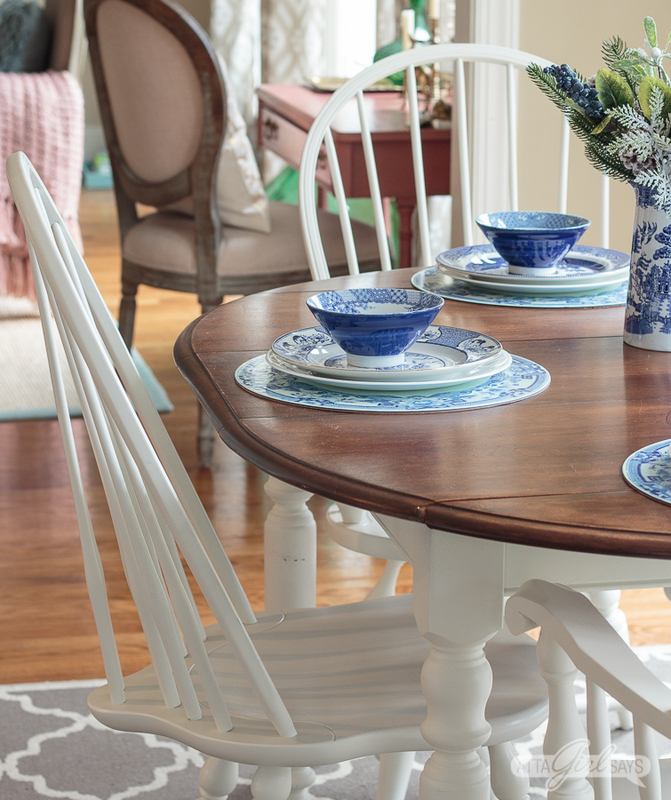 But now the table and chairs — with all those darn spindles — have a fresh look that I’m loving. And the project didn’t take forever because I used the right tool for the job — my Wagner Studio Pro Sprayer. It comes with two different nozzles — a smaller one for furniture and cabinets and a larger one for walls and ceilings.. 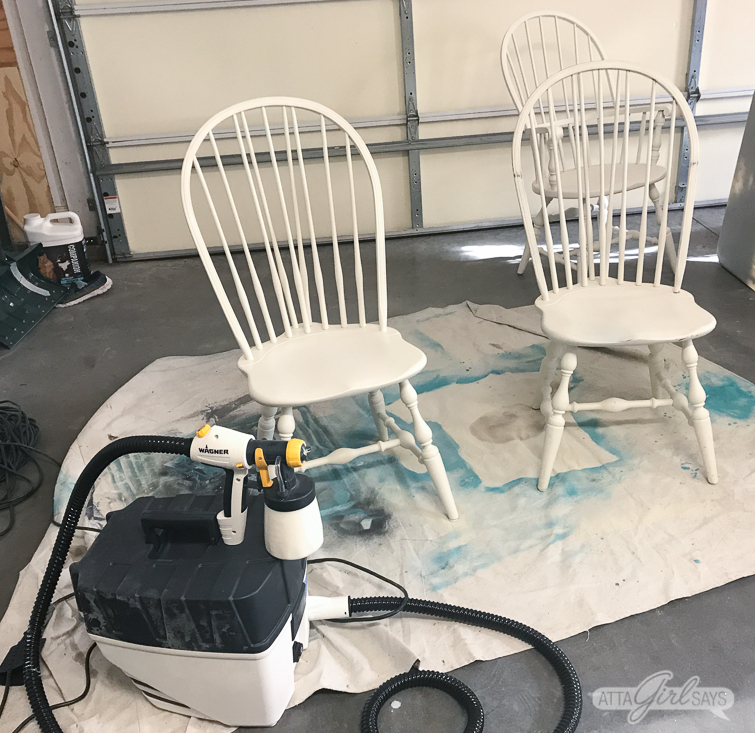 The Studio Pro is a great sprayer for DIYers and furniture upcyclers because you can use chalk paint, milk paint, latex paint, urethanes and sealers in it. 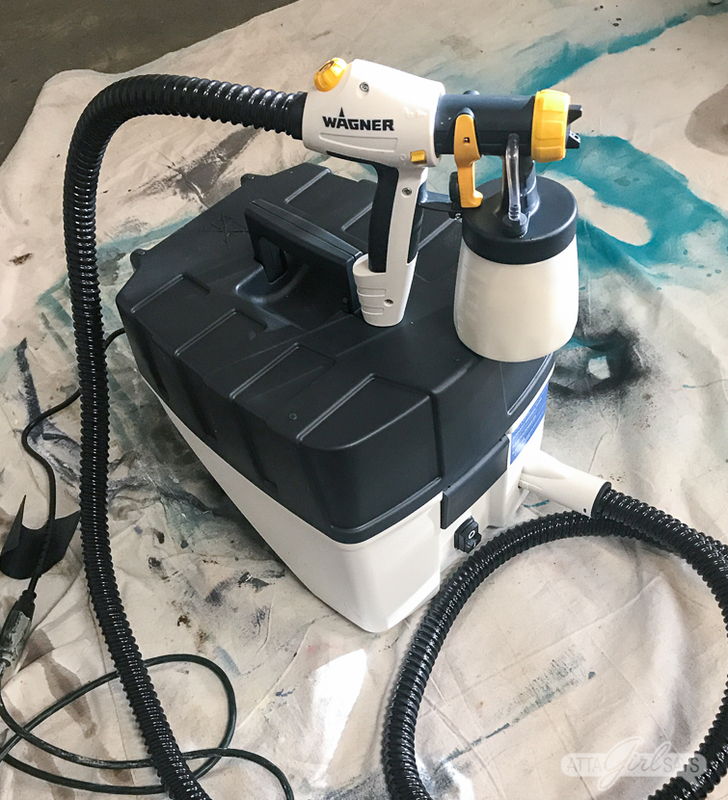 I’ve used them all in my Wagner sprayer, and I can say it handles the different materials like a champ without clogging, spitting or tons of overspray. 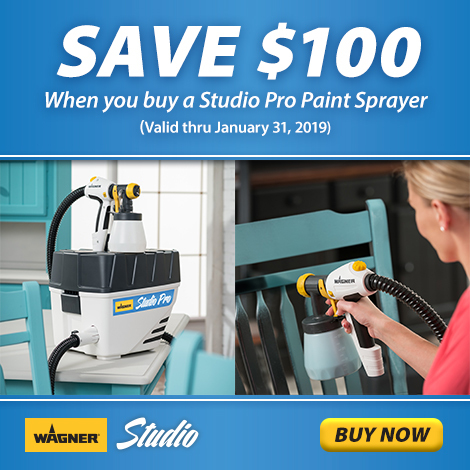 Right now, Wagner is offer $100 off a Studio Pro Paint Sprayer through Jan. 31, 2019, exclusively for our readers. 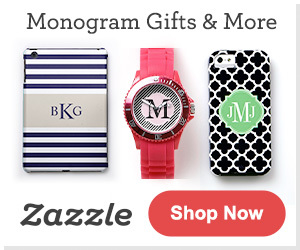 Just click HERE or on the coupon above to get the discount when you order directly from Wagner. My pals Kristy from Robb Restyle and Kim from Hunt & Host tackled two paint makeovers in their homes, while I used the sprayer on furniture. 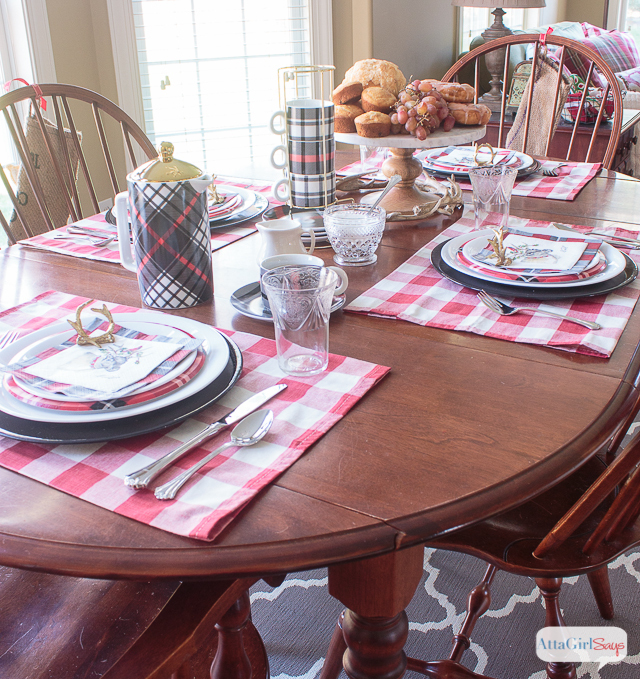 Namely my kitchen table base and those blasted Windsor dining chairs with a total of 32 spindles for a set of four. If you do the math, that equals insanity and hours of work if you tried to paint them with a brush. But with the sprayer, it took me about 10 minutes to spray each chair with one coat of paint. I detailed the entire process over on my Instagram stories. 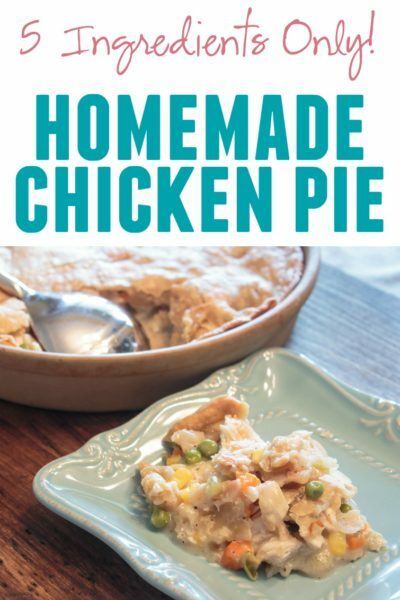 Just click on the play button below to view the highlighted story. This most recent kitchen table makeover is actually the second time I’ve painted these chairs with my Wagner sprayer. 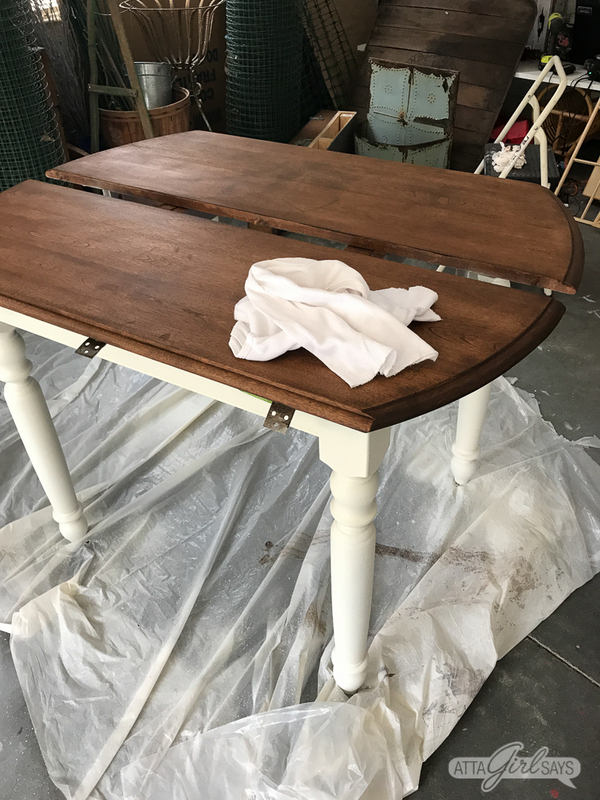 Since I avoided this DIY project for years, that should tell you something about how easy a paint sprayer makes these types of furniture makeovers. 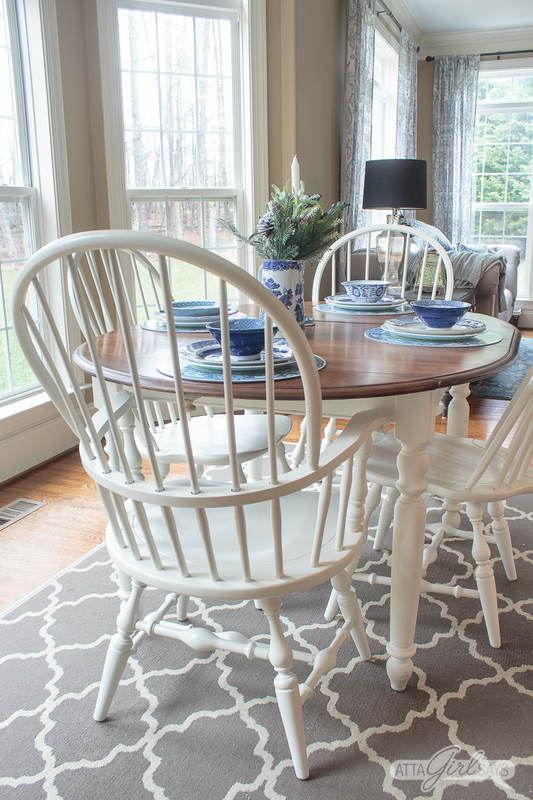 The first time I gave this set a refresh, I painted the chairs with General Finishes Milk Paint in Antique White. I did not seal them with a topcoat because one is technically not required with this particular kind of milk paint. But after a year of daily use, the chairs got pretty grungy, and they were showing some wear and a few scuffs. So I decided to give them a refresh for the new year with a new coat of paint and a topcoat to seal them. 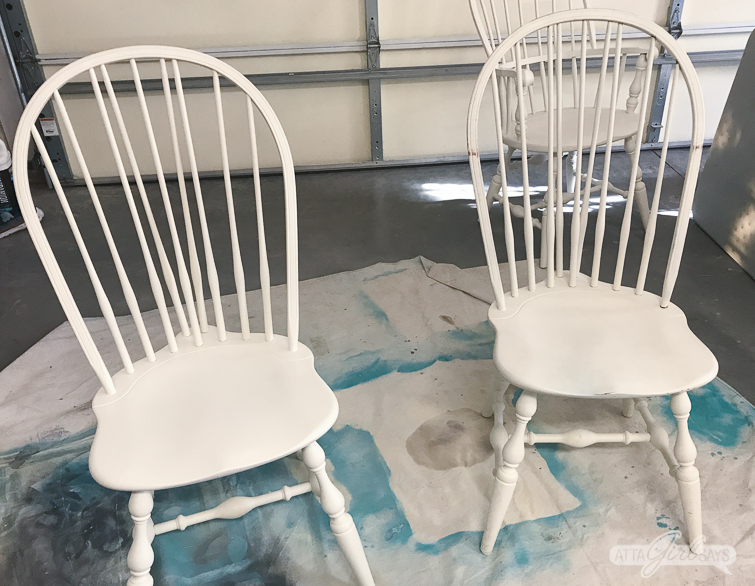 You can see the before and after in my stories and in this side-by-side photo of a newly painted chair and a dirty, scuffed one. Before painting the chairs, I cleaned them with a mixture of TSP and water. You could also use a cleaner or degreaser like Simple Green. The first time I painted these chairs over the high-gloss factory finish, I sanded them lightly. We also stripped the tabletop before refinishing it with General Finishes Gel Stain in Antique Walnut. For furniture projects, I recommend using the smaller Control Finish nozzle on the Wagner Studio Pro sprayer. 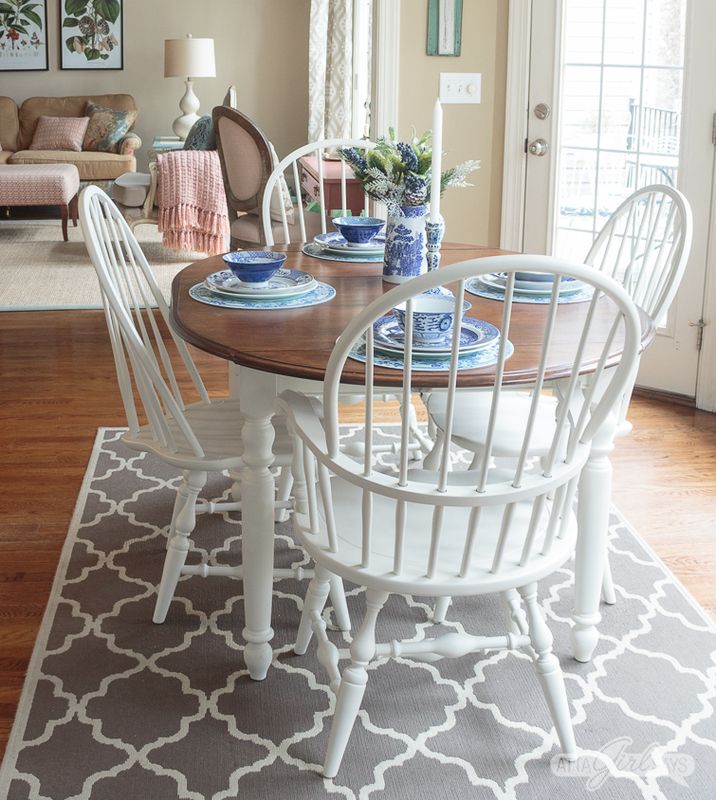 It’s the perfect size for spraying small to medium-sized pieces, like this table and chairs. I would also use it when painting a dresser or armoire and reserve the larger nozzle for walls and rooms. The two nozzles aren’t the only great things about the Studio Pro. I like that you can adjust the spray pattern on the nozzle to spray horizontally, vertically and diagonally. This enabled me to paint the spindles of the Windsor dining chairs without a lot of overspray or paint waste. Be sure to check out the product manual for tips on adjusting the spray pattern to match your particular project. One thing I’ve learned to do when painting chairs, spindles and furniture legs is to spray from various angles to ensure complete coverage. 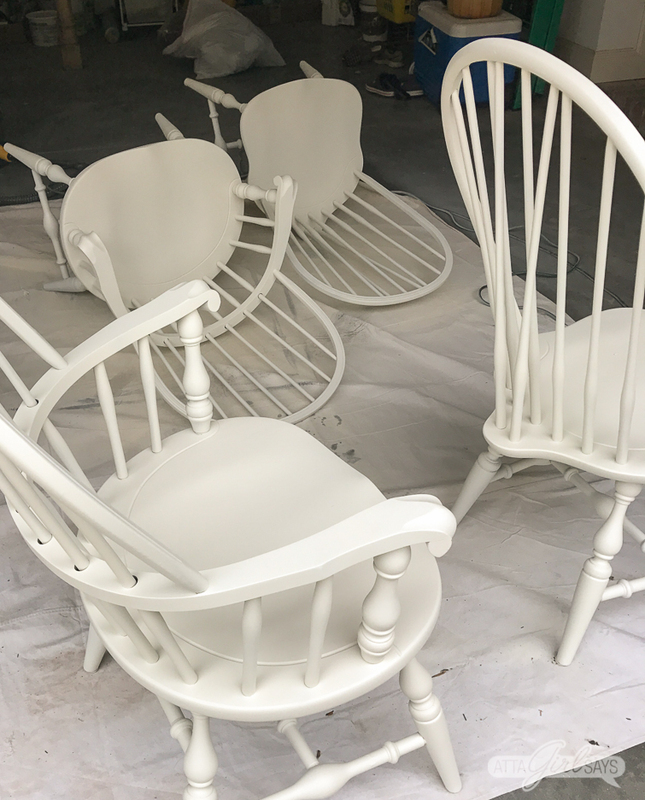 I started out with the chairs upright, but as each coat of paint dried, I turned them on their sides and upside down to ensure every surface was covered. 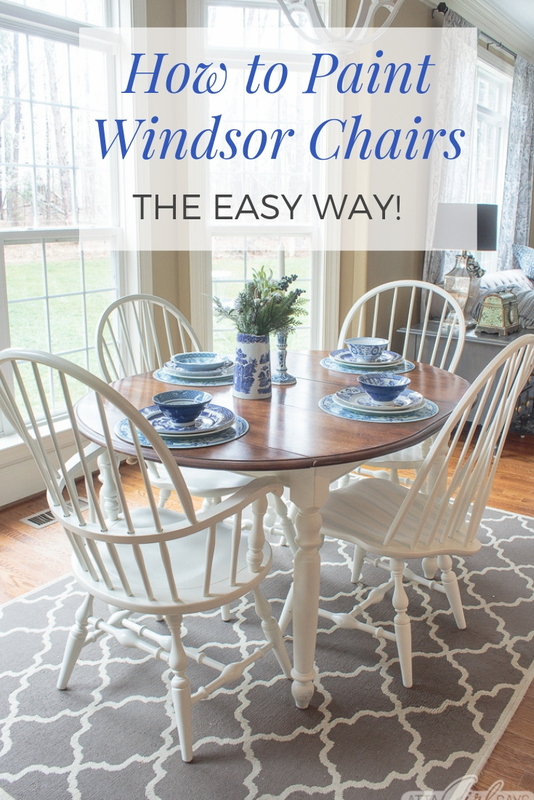 Even though the Wagner Studio Pro made painting these Windsor dining chairs so much easier than using a brush, I don’t want to repeat the chore anytime soon. So after painting them, I applied a topcoat to protect them from scuffing and so they can be easily cleaned. I used the Studio Pro Paint Sprayer for that, too. 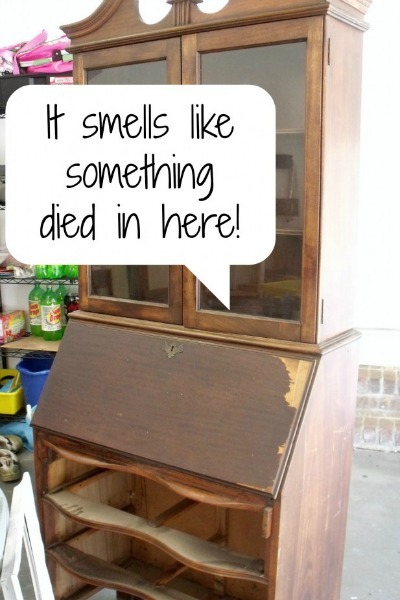 It can handle a variety of coating materials, including thick milk paint, stains and topcoats. I used a high-performance, water-based topcoat on the chairs and table, and strained it through a fine mesh stainer before spraying with the Studio Pro. Thin, controlled coats are the best when spraying a topcoat. You’ll definitely want to adjust the material flow and air control, and I recommend testing on a piece of cardboard or wood before spraying your furniture. 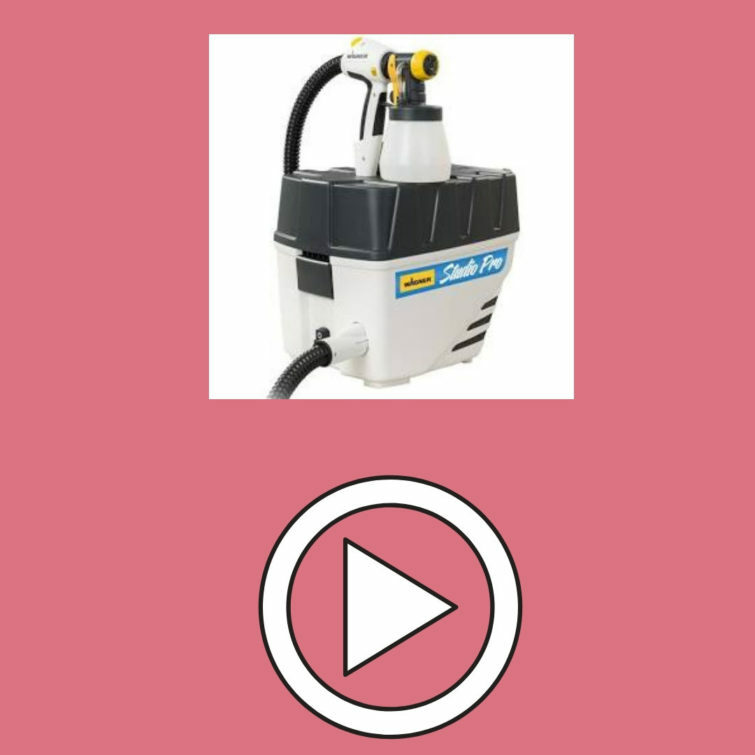 Wagner has some great tutorial videos for how to use its sprayers on different surfaces and with different materials. 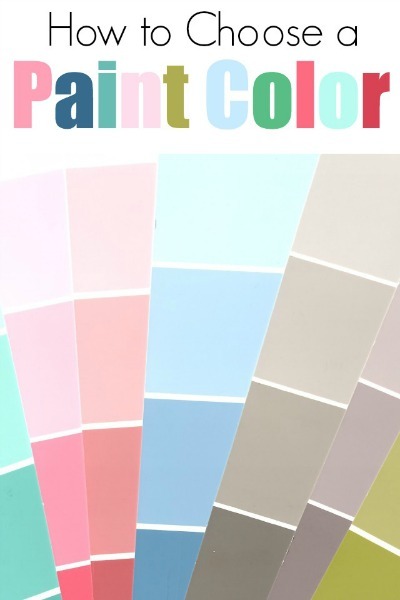 You’ll get lots of useful tips to help with your first paint sprayer DIY project. 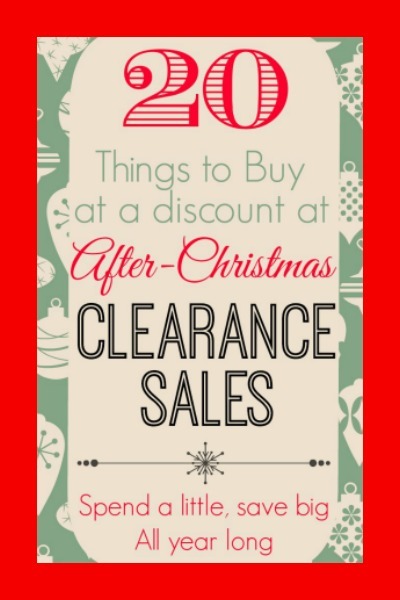 Dont forget to use the coupon to save $100 on the Wagner Studio Pro Sprayer. Such a nice change, so much brighter! A paint sprayer is the only way to go on chairs like this!!! So true. I’d probably still be painting them with a brush! Thanks, Kristy. We’re definitely loving the fresh new look.